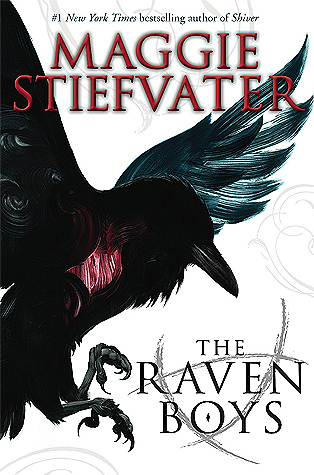 The Raven Boys by Maggie Stiefvater is the first book in The Raven Cycle. I have heard a lot about this series and I know from reading her stand alone novel The Scorpio Races that I love her writing style so I was super excited to read this book. I listened to the audio book version, here’s my review. Blue lives in a house of psychics but isn’t one herself. The world of the supernatural is something she knows but isn’t a part of until she sees the ghost of someone soon to die. Richard Gansey the third has an easy charm and access to all the money he could ever need. He directs his attention to finding an ancient and lost king with a group of his friends. When the two meet Blue gets a change to be a part of a world she always knew existed and Gansey gets closer to finding what he desires. I loved how this book hooked me in, although the story was a bit slow to start after the beginning. I like how the magic blended in so well with real life. It was a different take on the urban fantasy genre which is a genre I don’t usually enjoy because it usually entails a group of magic users or vampires or angels who the main character discovers they are secretly a part of or falls in love with a member of. There were quite a few characters but they were all given an opportunity to shine and felt like real people. The main focus is this book (and I’d go as far as to say in most of Maggie Stiefvater’s writing) is on the characters and their relationships with each other. I really enjoyed getting to know all the characters and I have come to love all of them but I know that some people don’t like stories with much plot. There was a large focus on some of the characters in this book so hopefully there will be more of Ronan and Noah in the next (and other) books in this series. I listened to the audio book version of this novel and I really liked the narrator. This is the first audio book I have listened to and I do plan to listen to the rest of this series. I liked how the narrator did different voices for the characters that didn’t seem creepy or forced and fitted easily into my picture of the character, even adding to my perception of them. I am also glad that I didn’t have to figure out how to pronounce some of the words for myself. Aglionby?? I would pronounce it Agg-lion-bee which sounds so unnatural. From listening to the narrator I thought it was just spelt Aglyn B, as in Aglyn Boys school… boy was I wrong. I liked how there was a positive representation of adult figures with the female psychics which is not common in YA novels because the author wants that character to have to figure things out for themselves. The adult figures were done really well because they weren’t perfect, they made bad choices but at the end of the day they were looking out for the kids. Also can we just take a moment to appreciate Maggie Stiefvater’s writing?? It is so lyrical and amazing. If I can write half as well as that then I will be happy. I give The Raven Boys four out of five stars. I really enjoyed this book and I am really looking forward to reading the next one. I would highly recommend this book to anyone who is looking for something a bit different. I have this book on my TBR list! Well I would highly recommend the Raven Cycle’s audio books, the narrator does awesome voices especially for the women of 300 fox way. The first book in this series was the first audiobook I listened to and I am so glad I had a good experience with it because they are so handy!